As the largest education-focused social enterprise in Malaysia, the JCF believes in the enrichment and improvement of those who are deserving. In 2015, the JCF and the Sunway Education Group in working together with Mercy Malaysia, set up the very first scholarship for international students from a developing country affected by a natural disaster. 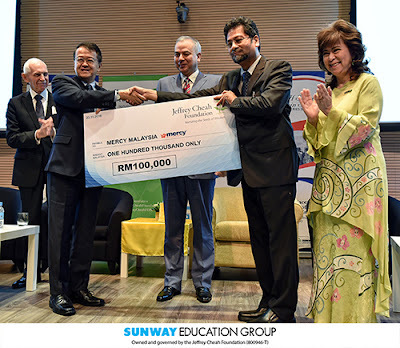 The JCF committed RM1 million worth of scholarships to the Mercy Malaysia’s Nepal Relief Fund. Through the Sunway Mercy Nepal Relief Scholarship Pratima Tamang, Bashanta Pudasaini, Upama Pokharel, Mira Silwal and Ajnish Ghimire are provided an opportunity for a better and brighter future. The scholarship covers the students’ tuition fees, accommodation and monthly living allowance for 4 years of study at Sunway. The JCF was set up by Tan Sri Dr Jeffrey Cheah based on the philosophy giving to society should never be an afterthought, but a steadfast commitment embedded in the very fabric of its past, present and future. The JCF serves to empower youths through education to lead them to better opportunities in life, in careers and in building a secure future to improve the quality of their lives, moulding them into responsible citizens who in turn give back to the community and the country. To date, the Jeffrey Cheah Foundation has awarded approximately RM270 million worth of scholarships to thousands of deserving young Malaysians.